Mitra Bagherzadeh was born in Abadan and completed her elementary and secondary education in Khark Island. She loved school and education and graduated from high school with highest distinction. Mitra continued her higher education at Tehran’s Melli University, in Management. Her second year in college coincided with the 1979 uprising in Iran when popular and student protests climaxed. Mitra enthusiastically joined the protests. She read books from the opposition People’s Mojahedin Organization and became familiar with iconic PMOI martyrs such as Fatameh Amini and Mehdi Rezai who gave their lives for freedom and were killed under torture in Shah’s prisons. This new knowledge transformed Mitra’s life altogether. Even though she loved studying, but she chose to devote her life to a bigger cause and a path full of challenges, the first one being to convince her father who loved her very much and did not want to see her hurt. She joined the PMOI in Tehran and started cooperating with its student association in Melli University. Mitra was humble and brave. She respected everyone but was courageous in the face of fundamentalist Basiji thugs who attacked the PMOI supporters on the streets at any opportunity. After the so-called Cultural Revolution, when Khomeini ordered closure of all universities, Mitra undertook the responsibility of directing a branch of government employees who supported the PMOI. After June 20, 1981, following the wave of street arrests and summary executions, Mitra used all her contacts and resources to provide protection for and supply the needs of PMOI members. 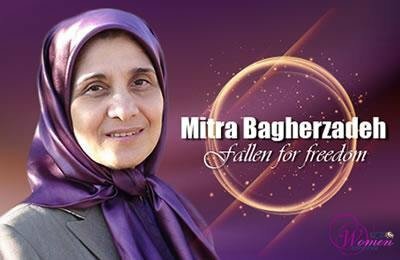 In summer 1982, simultaneous with the arrest and executions of large numbers of PMOI members and sympathizers, Mitra and a number of her comrades joined the PMOI in the Iranian Kurdistan and subsequently moved to the West to continue her activities for Iran’s freedom. When the National Liberation Army (NLA) of Iran was established in 1987, Mitra was one of the first women to lead an all-women unit. At this stage of her life, Mitra carried out her responsibilities effectively, with enthusiasm, courage and faith. She was hardworking, firm and kind. She always showed her love and respect for her colleagues and all people around her. Mitra was one of the reliable pillars of the organization, as her engagement in any situation brought about confidence and calm. During the period of relocation of the PMOI members from Camp Ashraf to Camp Liberty, Mitra was in charge of the PMOI’s legal team. Those who worked with her remember her working hard with little or no sleep or rest over many nights. Mitra was among the 100 PMOI members who remained in Camp Ashraf to handle the legal issues of the Camp. Finally, on September 1, 2013, Mitra and 51 of her PMOI comrades were massacred in a vicious attack by special forces of the then Iraqi Prime Minister Noori Maliki who acted at the behest of the Iranian regime to annihilate the opposition PMOI. Nevertheless, their courageous fight set an example and a model for others to continue their path.